A unique anime I found out about that takes school and academics to a totally different level. It's called Baka and Test. This anime is about a high school where the teachers vigorously divide the students by their academic grades, giving the ones who do better in class a much more fancier class to go to while the ones who don't do as well being forced to stay in really low-down classes. Another thing is that they can summon fighters called Shoukanjuu that become stronger with higher grades, and do battle with them. The main character is a cutie pie named Mizuki who fails a test because she was unable to get there in time (and not because she didn't study or anything) and feels unfairly placed in the "loser lounge" area of the school, along with Akihisa, who also thinks their school system is seriously biased. They then decide to conduct a summoner war against the high-ranking ones and show they can be just as good as anyone else. It certainly takes school time to a whole new level, and it does have a lot of cuteness! 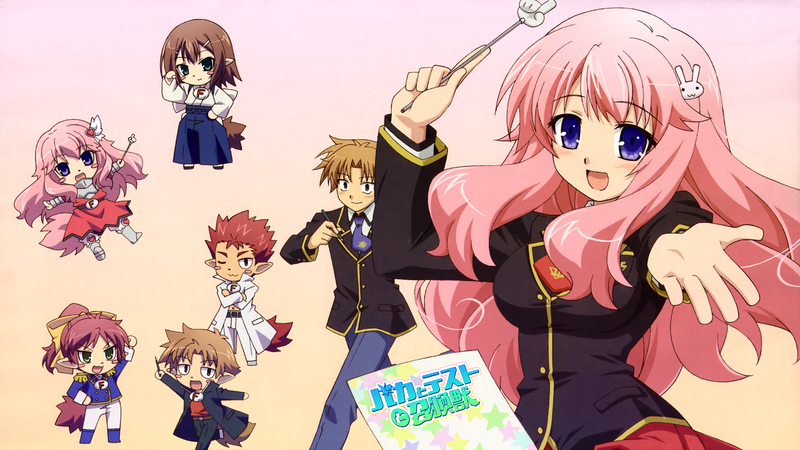 Anyone else seen Baka and Test? Watched the first season, was alright, but don't remember finishing the second because it didn't feel as good (happened a few times around that time, some comedy series got a second season and kinda tanked. Probably why some good comedy manga never get a 2nd anime season), but if I did finish it then it was because of Shouko, she was pretty much the only character I cared at that point. But as far as comedy goes, it's alright, had it's own flavour, I would've liked it more if it had more Shouko and less Hideyoshi.